S&P futures are down -24 thanks to a major meltdown in Asian markets. As I type this the Nikkei is down -2.3%, Kospi -2.3%, Hang Seng -2.03%, etc. The South Korean Kospi is at the lowest level since March 2017. 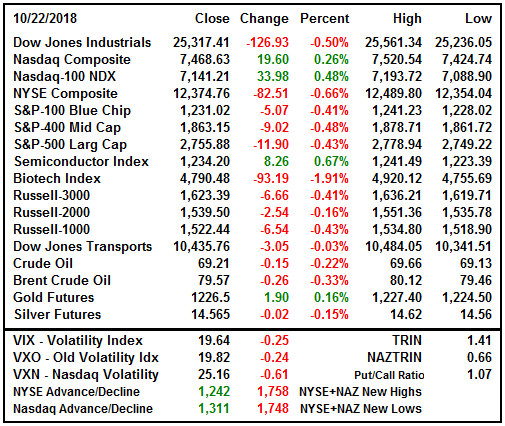 Things are not shaping up for a good open for the US markets. Rising global tensions from a dozen different reasons were being blamed. The weak us markets, up until recently a strong port in a global economic decline, added to the unrest. If the market in the strongest economy is faltering then weaker global markets have no chance. We talk about the decoupling scenario all the time when these types of situtations exist. The US can remain decoupled in the early stages but as the global weakness increases the US is eventually dragged into the swamp. This could be what we are seeing now. I wrote last week about the YTD declines in multiple major markets with countries down 15-17% or more while we were only 2-3% below our highs. We are a lot lower now and should the futures hold overnight we could be setting new zecond half lows on Tuesday. The Dow was weak on Monday but the Nasdaq managed to close in positive territory. The positive Nasdaq kept the Russell from crashing and it remained near the flatline. 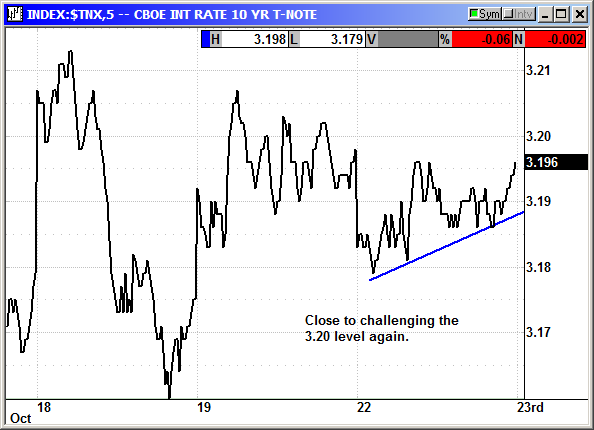 Stressing investors was the slight upward tick on the ten-year yield towards the 3.2% range. With the Fed comments suggesting at least four more quarterly rate hikes the rate worries are growing. The housing market has declined for five consecutive months and retailers that depend on housing are falling sharply. 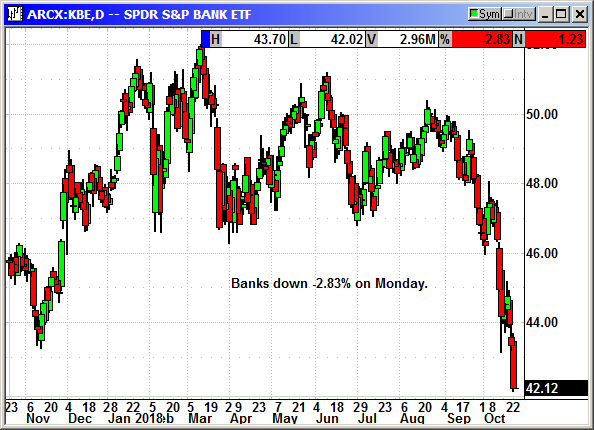 Banks are tanking for no particular reason. The KBE ETF declined 3% on Monday. With rates rising, banks should be doing great. 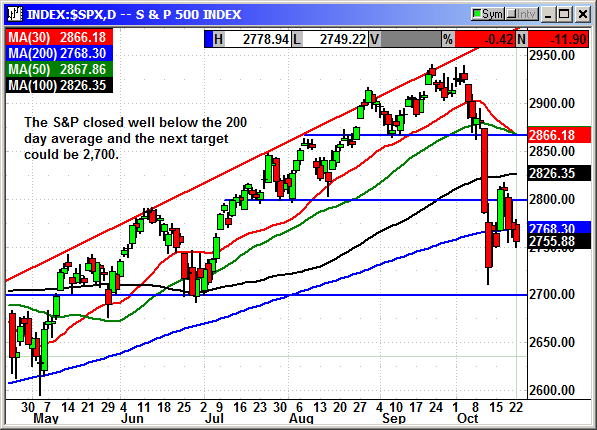 The S&P closed well below the 200-day average and right on the verge of cracking 2,750 and targeting 2,700. That 2,700 level is a red line for the market. A breakdown there would trigger an entirely new round of selling. The banks and the industrials tanked the Dow. Multiple comments about tariffs from industrial companies in their earnings commentary, tanked the prices for those companies yet to report. 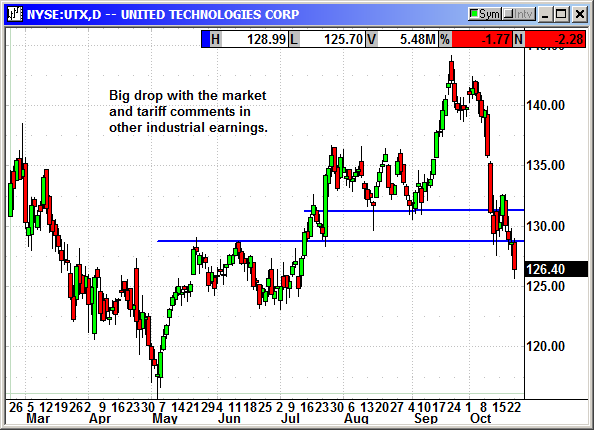 Caterpillar and United Technology are a couple of examples. 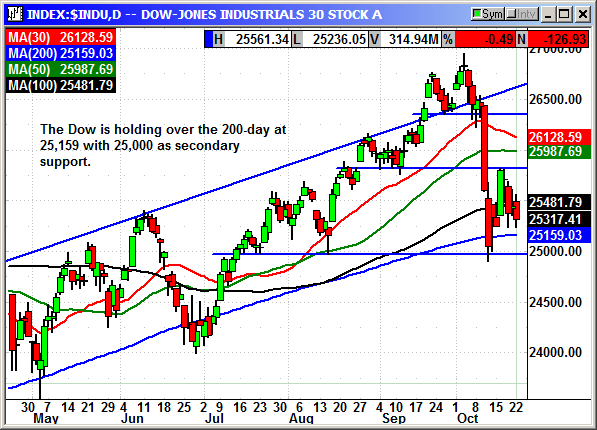 The Dow is holding over the 200-day at 25,159 with 25,000 as secondary support. A breakdown there would be a major blow to sentiment. Dow futures are down 200 points tonight. 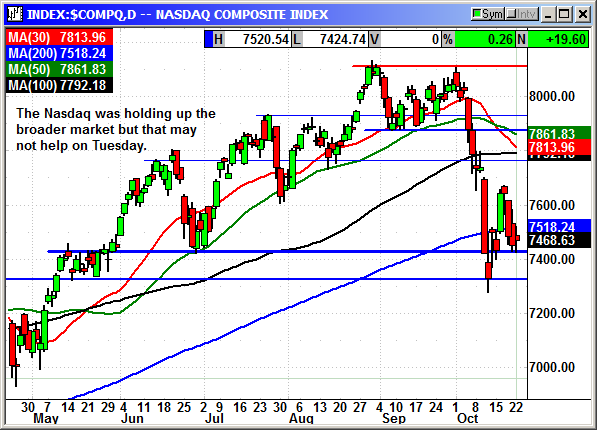 The Nasdaq remained positive and helped to hold up the Russell. Nasdaq futures are down 60 and Russell futures down -12. If these numbers hold overnight we will break some critical support levels on Tuesday. 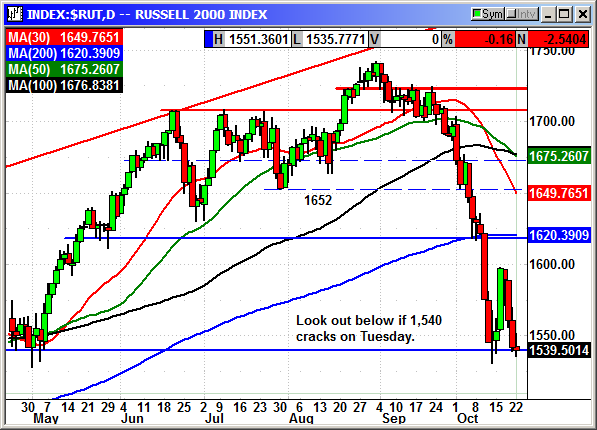 The Russell is threatening to break critical support at 1,540 and the next target could be around 1,495. This would be a blow to market sentiment and hinder any bigcap rebound attempt. The Richmond Fed manufacturing Survey is not a market mover unless there is a major miss of forecasts. That is not likely to happen. 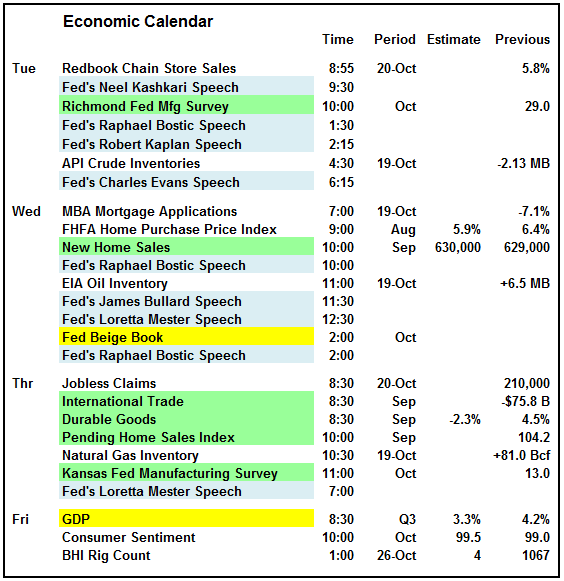 The Beige Book and the GDP are the two most important events for the week. 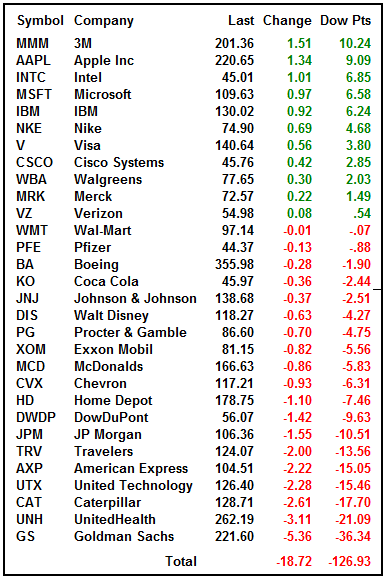 There are ten Dow components reporting this week. This could create additional volatility is we ses any post earnings pops or drops. I am recommending we stand aside until this current bout of market weakness plays itself out. The US economic fundamentals are strong as are the corporate earnings. These will eventually win in the current pricing battle. We just have to wait until the volatility passes and cooler heads prevail. With the S&P futures down -24 tonight I am not going to add a new position. There is no telling where we would get filled and the option premiums could be extreme. We need to just stand aside until the market stabilizes. If you want to try and buy a dip I would look at Home Depot around $172-$175. Those two hurricanes are going to power their earnings for the next three quarters. I would buy Adobe on any material dip. I hate that we got stopped out the prior week. That is a very strong stock being knocked around by the volatility. 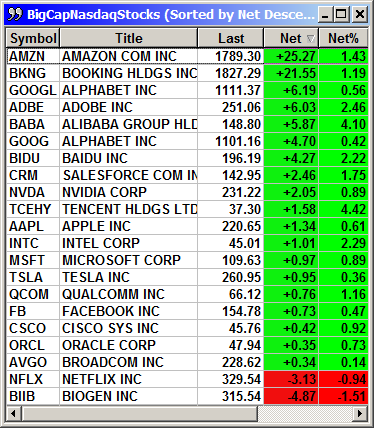 Lastly, the FANG stock everyone loved to hate is Facebook. They have been punished severely since July but shares still refuse to retest $150. There has been a lot of high volume selling but buyers are waiting. 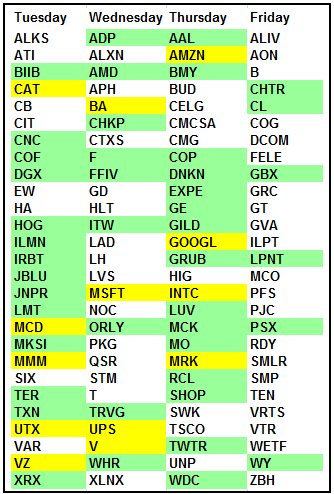 Earnings are Oct 30th and there WILL be a big move only the direction is unknown and the option premiums reflect this. I would be a buyer with a short-term option and realize it could go to zero in a heartbeat or be an instant double after earnings. The long position was closed at the open on Monday. 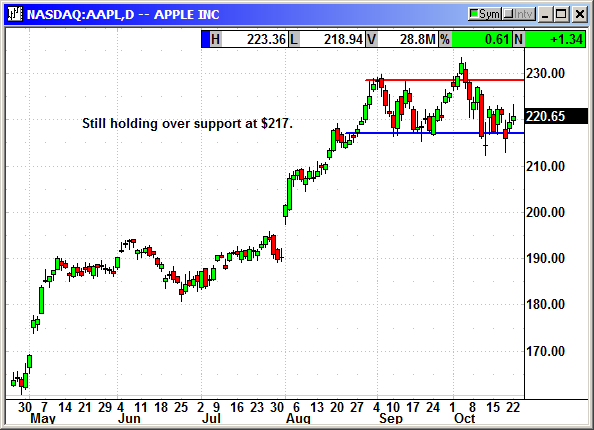 Apple posted a decent gain today and is holding well over the support at $117. A flurry of analysts have started recommending buying Apple before earnings because of rising ASP numbers and strong demand for the new product mix. They also have a new product announcement on Oct 30th in New York. That could also lift shares ahead of earnings, which is Nov 1st. Expectations are for $2.90 and $61.41 billion. 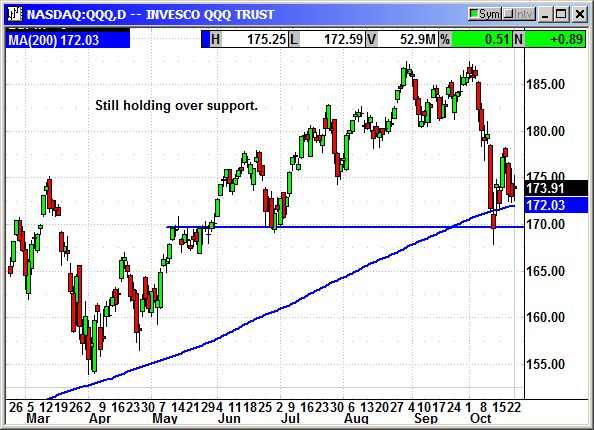 The Nasdaq 100 Index has been holding over support at the 200-day. That will probably break on Tuesday with the S&P futures down -22 Monday night. I am leaving off a stop to avoid the volatility. Fundamentals are still strong. 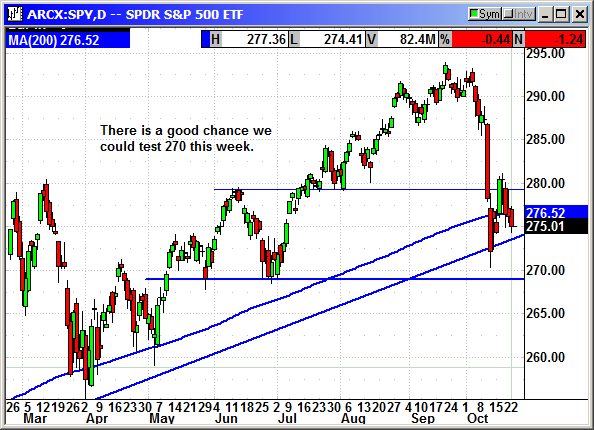 The S&P has been very volatile but the SPY closed today only 1 point from where we entered last week. Tuesday is shaping up to be a very bad day. Maybe we will get lucky and see a capitulation event. No specific news. Industrial earnings have included warnings or concerns of the impact of tariffs and shares of UTX crashed below support at the open. With earnings tomorrow, investors were running for cover. We closed the position at the open. Closed 10/22: Long Dec $145 call @ $3.55, exit .55, -3.00 loss. 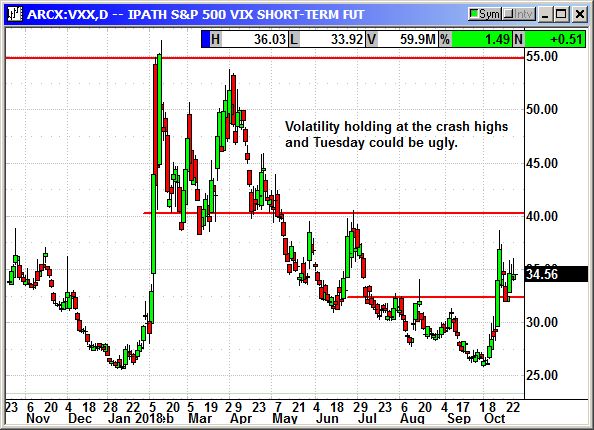 The VXX is retaining volatility with the Dow's wild swings. Tuesday could be extreme. This is temporary. The VXX always goes back to single digits when the market is in rally mode.